Bringing a kid (goat) home – is evidently very much like getting ready to bring home human kid. There is LOTS of preparation going on. To be perfectly honest … more than I thought and way more than Nick anticipated. 6. )and ….. fix any breaches in the fence. Fix any breaches in the fence. That is where the challenge begins. 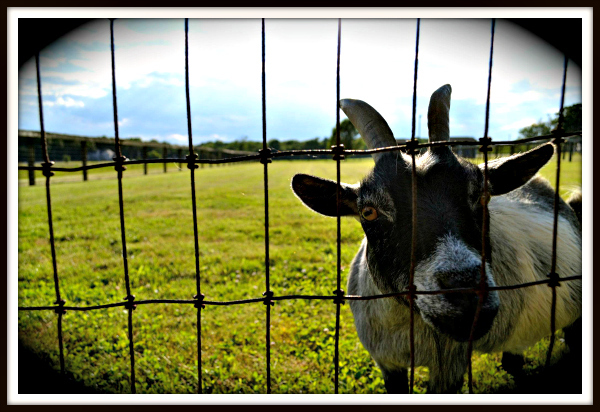 The expression “the grass is always greener on the other side” – is a lifestyle motto for goats. There’s always that extra crispier leaf, cluster of clovers or dangly piece of bark – just out of reach. Sugar – our first goat – we came to realize – was entirely too old and too content to be bothered with going anywhere other than our pasture. She was very well aware that she had a good acre of horse pasture all to her herself and she wasn’t about to risk any of that. Our first two days with Persnickety – who happens to be a VERY VOLUPTIOUS African Pygmy – however – were filled with surprise outbreaks. We even came home from church, one Sunday, to find her munching on our front lawn. She evidently was limber enough to flatten herself under our(what we thought was) very “Goat Proof” fence gate – and pop right onto the other side. We quickly caught wind and were able to fill it up high enough with dirt to avoid any more jail breaks. Luckily for us, though disappointingly, for Snick-snack (as Nick lovingly refers to her) she has nothing to climb onto. Goats are obvious climbers and will use any means to propel themselves OVER fences. So we figured – before Nubbins gets home – we’ll walk the perimeter and fix any gaps we think he might be able to get under. GREAT! Then I went to visit him last weekend. Evidently – our little boy hasn’t grown as much as we had anticipated he would. And – he’s a climber and a crawler. If he thought leaving mommy was tough – having to put up with Big Momma Persnickety is going to be far worse. She’s boss of the acre now – and she’s not afraid to let ANYONE know it. If anyone is going to try to climb, crawl and sneak his way out of the pasture – it’s going to be our little nutty Nubbins. We have a whole lot of OLD fence and ONE very teeny determined goat. So where does that leave us? With a 2 1/2 day ETA and an acre of fencing to mend? We’ll it has Nick outside boarding up obvious gaps between the ground and fence. He’s been working since 6am, was caught in a downpour, and is going against EVERYTHING he believes in home repair. Why? Because he loves me. AND I’m just the luckiest girl in the world.